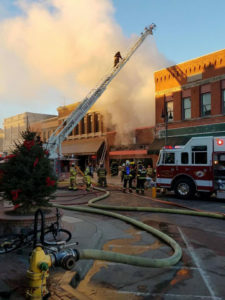 Fire destroyed a building in downtown Grinnell this morning. Grinnell Fire Chief Dan Sicard says crews were called at 6 a.m. on the report of flames coming from the roof of the building, which housed a Mexican restaurant. The cause of the fire is under investigation. People in nearby apartments made it out safe and no one was seriously hurt. “Everybody was evacuated from the apartments, we have one minor injury to a firefighter,” Sicard said. The Grinnell Fire Department was assisted by crews from Gilman, Kellogg, Searsboro, Malcolm, and Brooklyn.